The Press Bridge from PSC allows for easy and convenient audio distribution at press conferences. The unit features two, low-noise microphone pre-amplifier inputs for use with dynamic microphones, and a single line-level input for sending out house program audio or other line-level feeds. Each of the inputs has an independent level control for operating the Press Bridge without the use of an additional audio mixer. Twelve balanced, transformer-isolated microphone level feeds are used to send audio to the attending news crews. Additionally, three balanced line-level feeds are used to daisy-chain one or more of the company's Press Trains. Each of these outputs can feed up to eight Press Trains, each with twelve additional outputs, providing up to a total of three-hundred outputs. The twenty-four Press Train modules may be remotely located from the main unit using up to 500-foot standard microphone cables, thus eliminating multiple long cable-runs to each member of the media. 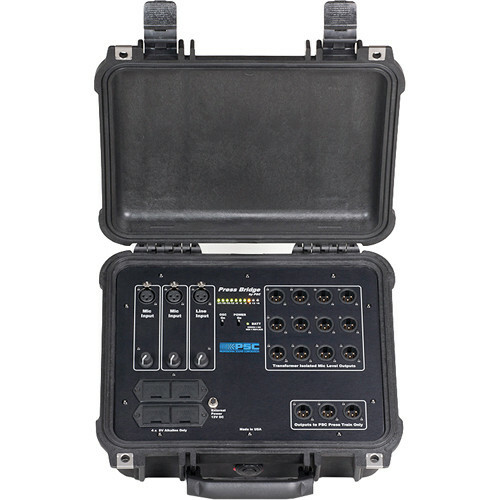 The unit is housed in a waterproof Pelican 1400 case for ease of shipment, and can be powered for more than eight hours using four 9V batteries, or via the included a 12V DC adapter. A built-in peak reading LED bar-graph meter and an internal reference tone oscillator are provided for level setting. A two-color power indicating LED lets the user know the condition of the battery. Box Dimensions (LxWxH) 13.5 x 11.4 x 5.8"